Last night, I was one of the lucky few who got a chance to meet and greet the guys of V Factory. For those who didn’t know them yet, V Factory is the fast-raising boy band from the U.S. who is now set to conquer the world and spread the “boy band fever” again. I enjoyed listening to Jared and Asher, because you can feel the excitement in their voices for their upcoming concert here in Manila as they share some of the coolest stuff about them. You can catch Asher and Jared and the rest V Factory, like Wesley Quinn, Nick 'Nicky T' Teti and Nathaniel Flatt tomorrow at SM Mall of Asia Concert Grounds. This is “the” biggest music event indeed, because together with the guys of V Factory, are some of our all-time favourite performers like Diana King, SWV, PM Dawn and All-4-One. Also gracing the event are the hottest performers of pop, hip hop and RnB from the U.S., like T.Q., Jojo, Baby Bash and Frankie J.
I’m sure, both the ladies and gents will be swaying along with these ultimate performers as they present their best-of-the-best acts. Now, I’m getting too excited. I never thought that this kind of event is possible to happen HERE IN THE PHILIPPINES! 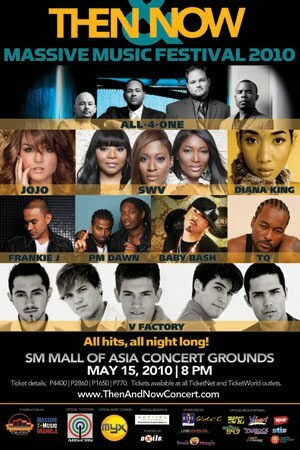 Now, are you ready for the Then & Now Massive Music Festival 2010? I already have a VIP ticket! Hahaha!